the San Fernando Valley, four miles southeast of the city of San Fernando, CA. complete the effect. You'll find the dam near the corner of Glenoaks and Osborne. riding a horse down the middle of a street, where she lassos a bad guy. This scene was shot on the 2000 block of Avenue of the Stars in Century City. The big, curved building to the right is the Century Plaza Hotel. (which are scheduled to be torn down soon). movie) to this beach home, where she's moving in with her boyfriend, 'Pete'. Matt LeBlanc on his back on the sidewalk. 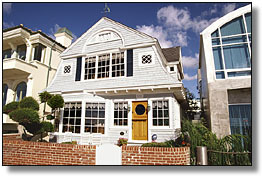 It is a real house, located at 2028 The Strand, in Hermosa Beach, CA. Here is a photo I shot of the house in 2003. Click on it for a larger view. between 20th and 21st Court. Lucy Liu's father, played by John Cleese, lives in a fabulous glass home. steep cliff over looking Benedict Canyon in Beverly Hills.